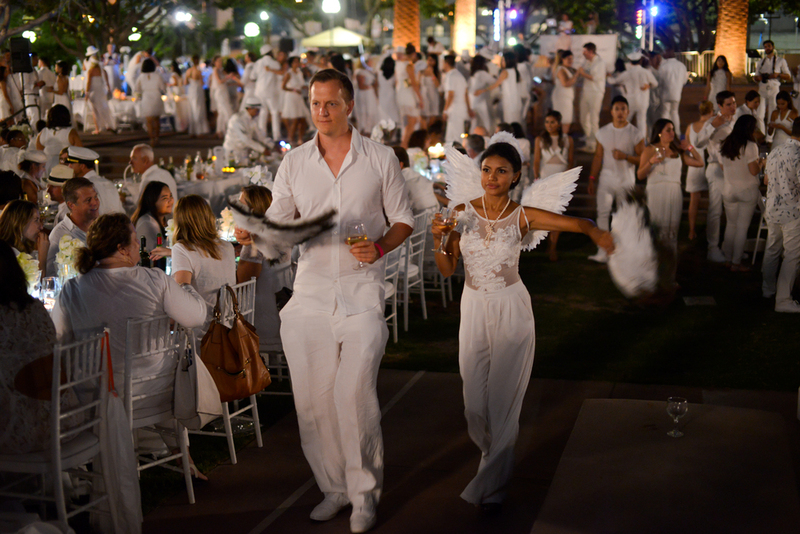 Imagine a pop-up dinner with 2,500+ people dressed in all white, from head to toe, and enjoying an evening totally disconnected from reality. I attended my very first Diner en Blanc event last week and was in awe the entire time. The location was kept a secret up until we arrived at the meeting location. I was lucky enough to be a guest of Celebrity Cruises and was taken care of in regards to dinner arrangements. Typically, you would have to bring your own chairs and food to participate. While I had a hard time finding an outfit for the evening, I was in amazement at the creative looks that were put together by others. The joy and enthusiasm felt that night is incomparable to any other event I've been to. No one was complaining a thing and everyone was extremely nice. It was like I was in a whole different world for 3 hours! My dinner included steak, lobster, cheese, crackers, and wine. A DJ spun tunes all night and photo opportunities were endless. KSOLE and I had such a great time that we cannot wait for the next event! Oh and our centerpiece was a conversation starter for sure, as we brought KSOLE's Starwars coin bank (hah). These photos really don't do the event justice so make sure to look at the videos from previous events including in Paris! It happens all over the world so check it out. Thank you to Relevance PR and Celebrity Cruises for this opportunity!